In the previous step you built and deployed your portal project. You can now start your application servers and log in to your portal. To start up the portal, go to the bin directory of your Tomcat installation. The first time you run the portal, it's going to take some time to start up. Wait for the message that the server has started up, e.g. Then open up a browser and navigate to http://localhost:8080/jetexpress/portal. You will see a minimal Jetspeed portal as shown below. 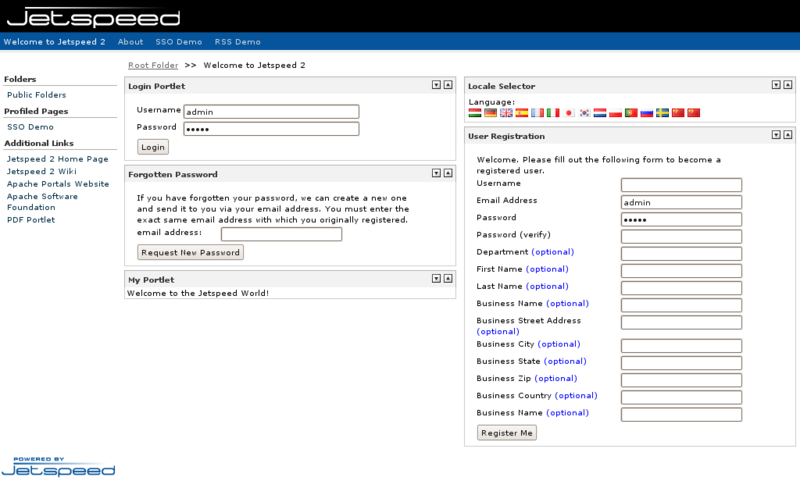 Login with the credentials admin/admin. You will be prompted to change the admin password. Now that your portal is up and running, let's start customizing it.